Yesterday GE (NYSE: GE) signed a strategic partnership agreement with Hewlett Packard Enterprise that will bring GE Digital’s breakthrough digital industrial solutions at scale to the Middle East, Africa & Turkey. The three-year agreement with HPE, is the first collaboration of this scale and scope in the region, and will focus primarily on cyber security solutions in Operational Technology, with the potential to move into other digital solution in the future. One of the first solutions this partnership will focus on is OpShield from GE Digital. OpShield was created specifically to protect critical infrastructure, drawing on years of embedded device testing and assessments of hundreds of industrial facilities. The solution reduces risk of cyber-related unplanned downtime; improves asset protection from cyber-related damage; helps safeguard protected health information (PHI); reduces risk of damage to reputation and intellectual property theft due to cyber incidents; and increases customers’ confidence to connect and optimize assets. In the first year of the partnership, GE Digital Cyber Security solutions will be distributed through the HPE Channel Partner Network across the MEA &T region, with a particular focus on the Gulf, Levant, Northern Africa, South Africa, and Turkey. By using this existing Partner Network with more than 1,500 partners in the region today, HPE and GED together will bring critical digital and cyber security solutions to industrial controls and infrastructure networks. 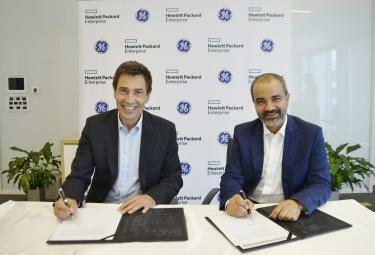 To enable this outreach, the HPE Partner Ready Program (recognized as the industry’s number one partner program in EMEA) will ensure that more than 340 HPE specialists and Channel Partner technical and sales resources will be trained and certified on GE Digital solutions to deliver the solution on HPE storage and server infrastructure. In addition, HPE’s own security capabilities for information technology infrastructure will complement the solutions provided by GE for the operational technology environment. GE Digital and Hewlett Packard Enterprise have also agreed to discussions around bringing Predix-based applications to the market. Predix is the platform for the Industrial Internet of Things – connecting machines, data, and people to power the digital industrial companies of the future. It is the foundation that enables industrial businesses to securely collect and analyze data in real time so they can operate faster, smarter, and more efficiently. Specifically, GE Digital and HPE will look at “on premise” Predix-based applications. Predix is the only platform that provides connectivity capabilities from machines, to full premises, and all the way to the cloud for a complete, integrated view of a company’s devices, processes, and people. GE has introduced its advanced digital capabilities in the Middle East, Africa & Turkey through several landmark agreements announced over the last year. With a presence of over 80 years, GE has more than 20,000 employees in the region driving the Aviation, Digital, Healthcare, Oil & Gas, Power and Transportation businesses.